LAS VEGAS, Nev. (July 25, 2008) -- Shooting lights-out in their only domestic exhibition contest, six players scored in double digits, including three with 20 points apiece as the 2008 USA Basketball Men’s Senior National Team (1-0) opened its five-game exhibition series with a 120-65 victory over Canada on Friday evening in the 2008 State Farm USA Basketball Challenge. 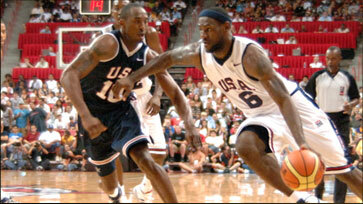 Played in front of a sold-out crowd of 18,498 fans at Thomas & Mack Center in Las Vegas, Nev., and an ESPN nationally televised audience, the USA was led by 20 points each from Carmelo Anthony (Denver Nuggets), Michael Redd (Milwaukee Bucks) and Dwyane Wade (Miami Heat). The fan avorites also received 15 points from Kobe Bryant (Los Angeles Lakers), Deron Williams (Utah azz) notched 14 and Chris Paul (New Orleans Hornets) tossed in 11 points and dished out eight assists.